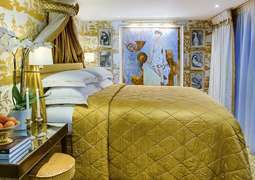 The S.S. Catherine is lavishly decorated with finely crafted furnishings including antiques and original paintings, and an indoor swimming pool. The vessel was named in honor of the legendary French actress Catherine Deneuve. 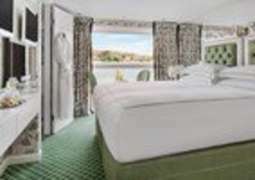 Category 1 staterooms and suites have open-air balconies, and Category 2 staterooms have French balconies on the Camargue Deck. Staterooms on the Avignon Deck feature French balconies. All staterooms and suites have handcrafted Savoir® of England beds, 100% Egyptian cotton linens, and a choice of pillows. Other amenities include built-in closets, hair dryer, individual thermostat, flat-screen TV with infotainment center and satellite, bottled water and a safe. Marble bathrooms feature L’Occitane en Provence bath and body products, plush towels, towel warmers, heated mirrors, and bathrobes and slippers. The Cezanne Restaurant is forward on the Avignon Deck and is the main dining venue for breakfast, lunch and dinner. There are two options: a lavish buffet with stations for hot food and cold salads and also a menu for a la carte fare. At dinner, the restaurant is menu service only. The cuisine onboard is continental, with a contemporary flair. Also unforgettable on S.S. Catherine is the Bar du Leopard. Taking multi-functional to a new level, the lounge serves as the ship's secondary eatery, dance venue and chill-out space. It is clubby and yet also funky, thanks to the leopard-print fabrics, elephant-head bar rails and other safari-themed fixtures. Perhaps the most distinctive feature of the Bar du Leopard is its glassed-in swimming pool. 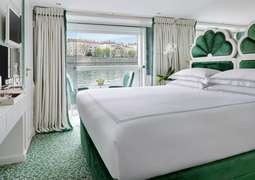 Because low-slung bridges on the Rhone River limit sun deck features, S.S. Catherine's pool has been spared nothing, and the result is a gorgeous space. In keeping with the lounge's jungle theme, it has a lush, garden-esque mosaic tile mural. During the day, you should wear sporty-casual clothes. In the evening we recommend stylish clothing.